Officially opening at the end of 2011, Savico Mega Mall is the largest commercial center in Vietnam with the total area of about 60,000m2. 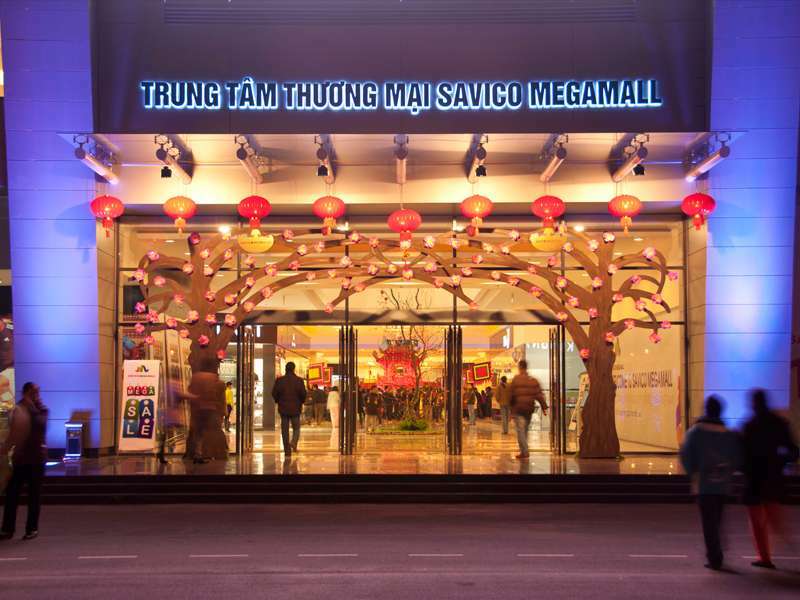 As the most modern shopping center in Long Bien District, Hanoi, Savico Mall provides capital citizens one more choice for shopping and entertainment besides the already over-capacity run like Vincom, or The Garden. Savico shopping center features a big blog consisting of three floors and one semi-basement which is dedicated for shopping, dining and entertainment, a smaller one for car display, together with a spacious area for parking, event organizing, interlacing with green trees and elevated water tank. Famous fashion and cosmetic brand names like Adidas, Converse, Vera, Etude House…can be found on the first floor of the building, while qualified electronic, high-tech products like 3D TV, HD cameras, and prestigious domestic computer center Tran Anh are available on the second floor. The supermarket Big C, sitting at the basement of the buildingand drawing ten thousands of customers every day, offers numerous choices for daily household products and abundant groceries. Savico offers customers a wide range of fast food restaurants including KFC, Lotteria, Pizza Hut, Hot wok and so on. For seafood lovers, elegant Seafood One on the third floor is really a good choice. The spacious restaurant with huge glass wall offers great view over the town: it is a wise choice for wedding reception or business party also. Mega Fun center with exiting games promises to give children and their family enjoyable experiences. In special occasions like Christmas, Tet or International Women’s Day, vibrant live music shows and exhibitions are held at spacious area in front of the major block. As planned, Savico Mall will soon include a modern cinema which will be an added bonus to the shopping center. Located in the less populated area of Hanoi (at 7-9 Nguyen Van Linh), Savico is easier to access to than other major malls like Vincom, which is also an advantage when it comes to parking and relaxing shopping experience. At the same time, the close proximity to the city center (only 5km far from Sword Lake) makes Savico an ideal get-away for families and shoppers on weekend. Treat yourself to some fine dining and luxury shopping at Savico! 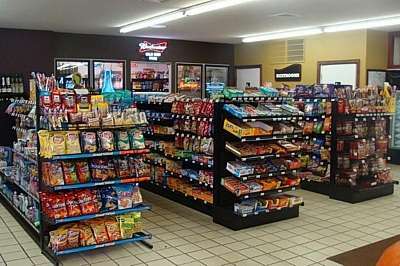 Unlike many Western countries where numerous convenience stores are set up on almost every street corner, and most in a standardized form, the business of convenience store has by and large been an informal activity. Not until recently are more and more convenience chains springing up in Ho Chi Minh City, the economic center of Vietnam. Its appearance aim to satisfy a customer market segment who are in need of grocery late at night or early in the morning. The traditional retail chains such as supermarket or market are still playing its major role in the shopping habit of Vietnamese. Nonetheless, convenience stores are essential and act as an emergency-aid for their urgent needs. Price of goods in these stores is a little bit higher than the market but still affordable. Since 2006, there are several chains of convenience stores in Vietnam, mostly seen in Ho Chi Minh City. The 3 most popular ones are Shop & Go, Circle K and Family Mart. Shop & Go was first established in 2005 at 74A1 Hai Ba Trung Street, District 1. Until now, it has expanded up to 70 stores nationwide. It offers a wide range of products: alcoholic beverages,confectionery, food, groceries, newspaper, etc. Shop & Go also has other service: phone cards and ATM. There are over 2000 products in each Shop & Go store, both local and imported products. Therefore, if one is seeking some foreign products, they may find Shop & Go suitable. * 74A1 Hai Ba Trung Street, District 1. * 254 Nguyen Cong Tru Street, District 1. * 152B Tran Hung Dao Street, District 1. * 194 Bui Vien Street, District 1. The American franchised convenient store Circle K appeared in Vietnam in mid 2009 by GR International. Besides Vietnam, Circle K has been in China, Hongkong, Japan, Indonesia for a long time. Realizing the potential of the retailing market in a bustling economy in Vietnam, GR International aims to offer customer a new way of shopping beside the traditional way of going to the market or supermarket. They offer wide range of products from snacks, tobacco, hair care products, stationery, to fast food. Some American products can be found at Circle K.
Family Mart, a franchise convenient store business from Japan, started its operation in Vietnam in Decmeber, 2009. After 2 years, Family Mart has increased its number of store to 18 which is still too small in comparison with the giant Shop & Go (70 stores). However, with its Japanese-based , Family Mart has it competitive advantages. People love Family Mart because of its oriental taste of food and a variety of “hot” dishes for meals, the common cultural point of Asian countries. Hygiene and nutrition are two strengths of food offered in Family Mart. Rice Ball and Banh Bao can also be found here. Beside, train tickets, movie tickets and ATMs are available. More information about other stores can be found at Family Mart website. Since its opening in early 2008, Syrena, lying at the heart of Xuan Dieu Street, has been known as a preferred choice for expatriates living in Hanoi. Consisting of a Shopping Center and Luxurious Apartments for rent, this modern 25-floor tower offers customers retail, leisure and lifestyle. Located on the first and the second floor of the tower, Syrena Shopping center, with a total area up to 5000m2consisting of a supermarket, restaurants, and 30 shops/stalls, is an ideal place for people to purchase diversified things, from canned foods, kitchen ware to fashionable clothes, costly jewelry and interior furniture. You need some pastry for the party, a bottle of wine for the dinner, or diapers for your baby? Just by a food store called Annam Gourmet on the first floor or Fivimart supermarket on the second floor, where high quality food productsand other necessities for daily life are available.Meanwhile, the appearance of prestigious fashion brands such as United Colors of Benetton, Anamai, L&D, Ogawa, or Laoyechesurely satisfy any stylish shopper. 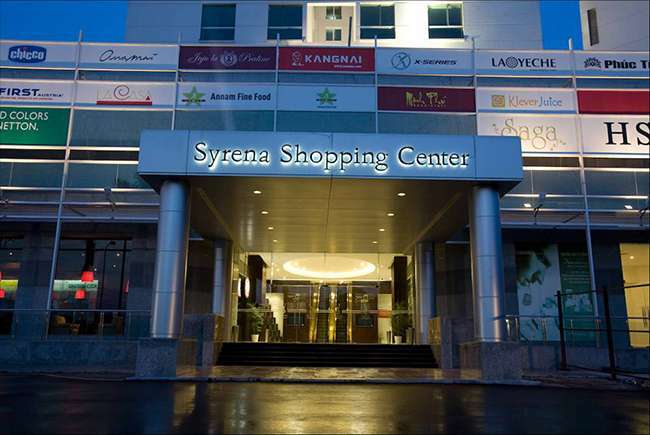 Nestled on the shore of Hanoi’s largest lake, Syrena is not only a place for shopping but relaxation also. After intense working time, one can have relaxing moments when enjoying coffee with friends in the Highlands or dining with family in the Zpizza restaurant. For those who love healthful physical activities or beauty care, Elite Fitness & Spa is perfect place for them. Moreover, there is a play ground called Tini World with many toys, modern games and exciting activities on the second floor that can satisfy any hyperactive kid. Just come here, leave all burdens behind and enjoy the life! A Dental Clinic and agency of Air Mekong on the first floor add more convenience for customers who shop in Syrena. Customers, especially, tourists can easily get useful tourism information or book a flight at Air Mekong agency. Besides, two ATMs of HSBC and Vietcombank which are put at two sides of Syrena’s main door facilitate well for customers’ shopping. Syrena Shopping center, no. 51 XuanDieu road, Tay Ho district, Hanoi. Syrena is approximately 10 minutes from the Hanoi Old Quarter, and 30 minutes from the Hanoi International airport. One can get there easily by taxi or xe-om. You are in Hanoi for the first time and being allured by its diverse range of goods that you don’t know which ones are the essential you should buy? This article is going to make the complicated question become piece a cake! 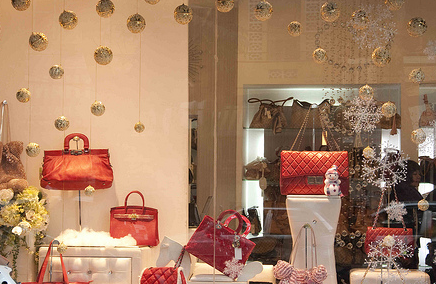 If you think that Ho Chi Minh City is the only shopping heaven, think again. Hanoi has its unique charm when it comes to buying stuff - and by stuff - we mean strange unique things that cannot be found anywhere else. Below is a list of what we think visitors can take home with them, as a small piece of Hanoi. Walking along Hanoi’s Old Quarter ones should notice an abundant number of art shops selling paintings and pastel pieces. If you want to keep memory or want some evidence about your trip to Hanoi, don’t hesitate to walk in and pick up one of Vietnamese propaganda posters or original artwork at a surprisingly low price varying between $2 and $30. If you are an art-holic who never satisfy with cheap artworks, upscale galleries around Hanoi are always open to you for spending several hundreds to thousands of your dollars. It would be a big mistake if tourists fail to taste dried spiced beef sold on Hang Giay Street and dried sweetened fruits or vegetables (“Ô Mai” and “Mứt”) available on Hang Duong Street. Also, Hanoi is the only place you can see such delicious and authentic “Ô Mai” in Vietnam. This type of snack is very rich in term of species which ones may spend up to million and weeks to taste them all. If tourists have had chance to watch a show of water puppet, ones should have been mesmerized by special wooden puppet floating and acting vividly like real actors under the skillful hand of water puppet artist. If it is ones’ wish to take one of those puppets to bring home, don’t ever think of stealing one because there are many souvenir shops around the theater area selling reproductions of those puppets. Paying a price starting from $10, ones would possess a piece of sophisticated handmade wooden buffalo, a hero on horseback, cute dancing girls or a mighty dragon. Hanoi and its foods make you fall in love with this country so much and the only thing you want is shouting loudly “I love Vietnam”? You don’t need to compete with all kind of transportation running on streets to contribute more noise to this peaceful city by that way because souvenir shops on Dinh Liet or Hang Gai Street are always available to you with their lavish collections of T-shirt printed with cute slogan like “I Love Hanoi”; “I Love Vietnam” or “I Love Pho” – with picture of hot steaming bow of Pho on; and also in many sizes and colors. Also, on the same streets, ones are advised to buy one of silk products like scarf, tie or clothe; or brocade like bags; hats and accessories. 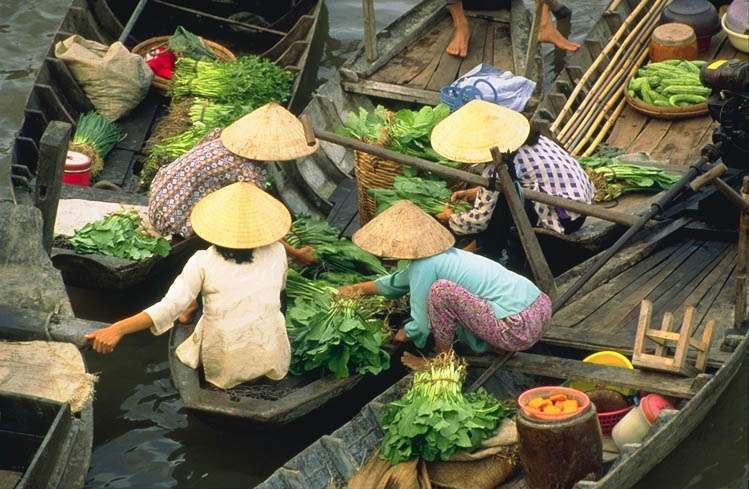 People said that “If one has not visited floating market, he has not visited the south-west of Vietnam”. Literally, floating markets which have been around for a long time make the liveliest part of life in the south-west, the land of rivers, canals and ditches. For tourists who travel to Can Tho, metropolis of the south-west, it would be regretful if they could not by and purchase something in Cai Rang (6km from Can Tho city), one of the most famous and biggest floating markets in the Mekong Delta. From Cai Rang Bridge, the market stretches half kilometre downstream Can Tho River. Hundreds of boats gathering here from the dawn till before noon makes the area extraordinary animated and the water surface colorful with numerous tropical fruits. The large sized anchored boats create meandering lanes for smaller ones to weave through. All create a bustling and joyful atmosphere that can attract any tourist. Most of the boats here are packed with a lot of farm products and specialties of Cai Rang Town, Chau Thanh district and the nearby areas like vegetables, coconut, banana, watermelon, grapefruit, dragon fruit and so on. Small boats that sell soft drinks, wine and food for breakfast go among the others to serve market-goers and visitors. Other services and products like mending machine, selling gasoline, mobile card, clothes, cosmetic, spicy, etc all are available here, not different from what are sold in common markets on land. Trading from boats brings excitement to buyers when catching some sample of products that are thrown by sellers from other boats. While shopping on boat, one can also enjoy fresh fruits and see floating house of the locals along the riverside. In this bustling floating market, the cries of the sellers seem to be swallowed in the vastness of the river and lost into the noise of boat engines. The disadvantaged condition turns out to facilitate the birth of an unique advertising tool: pole of sample goods. Every boat has a long upright pole with samples of the goods for sale hung on, so the sellers do not have to cry out what they are selling and buyers can easily see from the distance the goods sold on that boat. Just look up and ones can know exactly which boat selling the products they are seeking for. To catch the liveliest scenery and enjoy the most animated atmosphere of Cai Rang market (often 6 am to 8 am), travelers should stay overnight in Can Tho and come here at the dawn, about 5 a.m.
After enjoying local breakfast and watching the sun rising, one can charter either a motorized boat or a non motorized one to begin a morning shopping in floating market. The area where most of boats for charter are located is along Vo Tanh road. The fee is charged differently based on the kind of chartered boat. When travelers ask local people or tour guides where they can find the most various types of traditional Vietnamese gifts to purchase as souvenirs, most of them will receive “Hoan Kiem Lake” and “The Old Quarter” as the answer. The reason is that this is the most exciting tourist area in Hanoi where attracts a huge number of foreigner tourists to visits every day, so there are numerous souvenir and present shops located in this area. International travelers are easily caught wandering around this area all day and night to visit and explore the beauty of Hoan Kiem Lake and the ancient houses in the Old Quarter, and also to purchase some souvenirs to bring home as a memory of this charming city. Especially in the evening when some popular shopping streets in this area like Hang Ngang and Hang Dao turn to walking streets, more foreigners come to those crowded and busy streets to merge with local people lines and enjoy the amazingly exciting atmosphere of these places. Beside Hang Ngang and Hang Dao Streets, Bao Khanh, Hang Gai, Luong Van Can or Hang Can are also favorite locations for buying souvenirs. It can be ensured that souvenirs and gifts in this area are not only greatly diverse in types with hundred kinds of traditional Vietnamese items but also ingenious as they are mostly handicraft products made by skillful hands of experienced artists in famous vocational villages in Hanoi. However, foreigners purchase items in this area might have to endure significantly more expensive price than local people. That is the result of high rental cost of those shops in central position of the city, and also perspective of local vendors that international travelers always have cash Be prepared to bargain! Luong Van Can Street: kids' toys and other decorative items. Read Our Guide to 5 cannot missed streets of Hanoi's Old Quarter for more information. Ba Tieu Street is a long road that begins at Hoan Kiem Lake area and leads to Dai Co Viet Street. If there is a title to describe this road, this should be only “Street of shopping”, especially luxurious shopping. This road itself act as a market of various shops, restaurants and other service destinations that serve all customers in any range and class, but deluxe products seems to be more dominant and diverse in this street. Along the 2.5 km length of this road, numerous luxurious shops are located densely on both sides with different types of products and services, including motorbike, clothes and accessories, restaurant, phones and entertainment devices. Beside those high class shops which are pretty expensive, Ba Trieu Street also has a wide range of shops for middle class consumers with affordable price and acceptable quality. The biggest and most remarkable midrange place at this street is Vinatex Fashion Center, where exhibits and sells clothes and accessories made by domestic producers with competitive price to middle class customers. However, the paradise of superior shopping is situated at the other end of the road, where Vincom Tower is located. This commercial center is the complex of deluxe shopping malls and luxurious services which predominantly serve propertied people are has bigger purse than normal one. This place gathers almost reputable and famous domestic and international brands in Vietnam in any industry, from clothes, shoes to electronic devices. Consumers come to this commercial center will experience truly top class services and shops which might be only found in Vincom Tower. In order to best enjoy your shopping experience on Ba Trieu street, read our Tips on Buying Clothing in Vietnam. West Lake, or also called Ho Tay in Vietnamese, is the biggest lake in Hanoi and also in the second position on list of the most fascinating lakes in this beautiful city. This area is also the most popular living residence for expats and foreigners in Vietnam with a considerable number of non-Vietnamese residents in the region. The massive expansion in number of expats living in West Lake leads to the increase in demand of special goods for this kind of residents, especially convenient products such as foods, beverage and clothes, with a new green market emerging and attracting many local attentions. Therefore, various home shops which provide such kinds of goods have been established to satisfy the requirement of foreigners here. Those shops offer wide range of international products which cannot be easily obtained in Hanoi. Such food items as turkey for thanksgiving, Kraft Dinner, Kitkat Bar and Twinning's Earl Grey Tea are available for purchase here. Health products such as whole grain bread and brown rice are sold here as well. One can find those shops along streets around the West Lake such as Xuan Dieu, Au Co, Yen Phu or To Ngoc Van. Price at those places is slightly more expensive than other normal products or when buying in foreigner countries, due to the tax rate, but still acceptable and affordable to expats living here. Are you going to Vietnam in order to buy clothes with popular world famous brand names? Trendy or brand name clothes are often sold at an outrageous price, even for some with the tag "made in Vietnam" on it. Imagine the import tax + Vietnam sale tax + the supreme rental cost in Vietnam added all together. 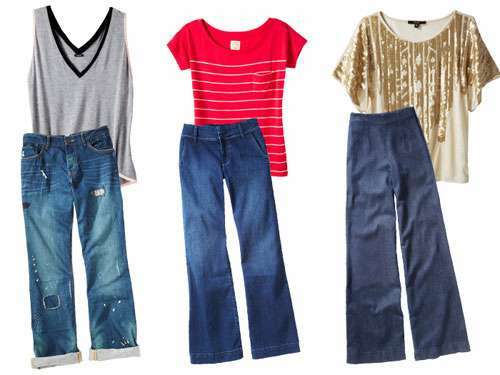 So what advice there is for those hunting for some good new pants or tees? In Vietnam, clothes are sold in three main areas, including shopping centers, local markets, and small shops along streets. 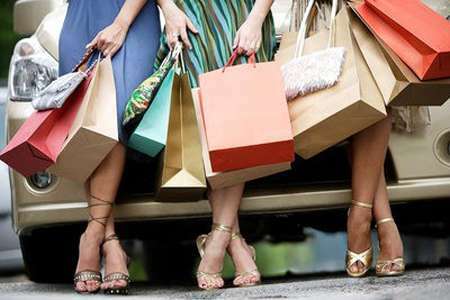 If you have nothing to worry about your purse and care much about the quality of your clothes, it is advisable to orient towards shopping malls, nowhere else. Shopping malls are located mostly in big cities in Vietnam, namely Hanoi, Ho Chi Minh, Hai Phong, Danang and the likes. In shopping malls, apart from high-end clothes, you still have a chance to grasp clothes of your taste with reasonable prices and of good quality, which are of Vietnamese popular domestic brands such as Blue Exchange, N&M, Canifa and Ninomaxx. Nem is a Vietnamese brand but its price is as costly as other international brands (expect $70 for a decent dress). Prices in shopping malls are fixed, thus your obsession with bargaining would be completely eliminated. To save your money, it is suggested to go to local markets and make full use of your smile and bargaining tips to get the best deal. Almost all clothes items sold at local markets are made in China with low quality. Moreover, almost all shops in local markets have no place for you to try on clothes, so it could be quite inconvenient to find your best suit. Yet, sometimes, luckily, you could catch clothes of acceptable quality and in trendy designs. Just keep in mind that you have rights to bargain and you should not miss the chance to do that. Saigon Square in Ho Chi Minh City and Nga Tu So Market in Hanoi are favorite local markets for shop lovers. Yet, as foreigners, you had better to avoid going to Nga Tu So Market because only local shopping experts could survive with bargains in this market. If you are not fond of local markets, its ambience as well as its inconvenience, clothing shops scattering on streets could meet your demands. Shops with Made in Vietnam signboards would be your ideal choice as their clothes are of quite good materials, in elegant designs and at reasonable prices. Better still, they have your size as almost all of their products are made for exporting. Shops of Vietnamese names or with English names that sound funny such as” Boys”, “Vietnamese Name+ Mode”, “Vietnamese name+ Fashion” and the likes often display and sell clothes made in China, and the quality as well as the price are also “better” than those sold at local markets. Yet, in some shops, despite of their showy façade, their clothes are no more than a collection of clothes sold at local markets. Vietnamese popular domestic bands also have their own stores laid on crowded streets. Ho Chi Minh City – What to buy ? This article points out some insiders' recommendations for visitors who are at a loss for ideas of what to bring home: souvenirs, gifts and everything in between. 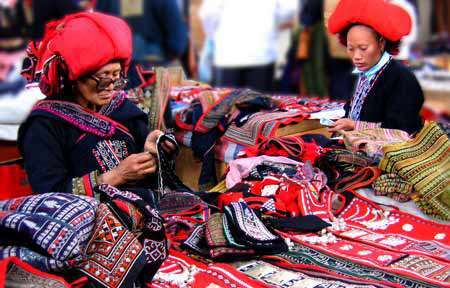 Handicrafts are popular gifts readily available in Ho Chi Minh City as well as in Vietnam. There are many different kinds of handicrafts such as embroidery, lacquer ware, vases, trays, rosewood boxes, wood-block prints, oil or watercolor paintings, blinds made from bamboo, reed mats, carpets, ceramics and leather work. You can easily get one in Ho Chi Minh City. These you-name-its are truly works of arts. 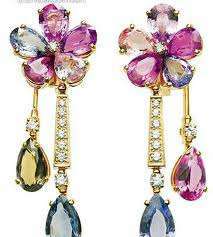 They are made by the skillful hands of the Vietnamese artists. The patterns are usually about Vietnamese people’s life so it is attractive to foreign people who are always curious about the life of an agricultural country. One way is visiting the handicraft shops in Ho Chi Minh City. There are many of them which are usually located in the center of the city (District 1 area). And there are some shops that are specialized in selling one kind of handicrafts only. Visiting these shops, you can find out more beautiful handicrafts with nice details that are skillfully and carefully designed. Just notice that the prices in these shops are usually higher. Approximate costs: $4-8 for a quality silk scarf; $3 for reed mats, $2 for rosewood boxes. There are many different souvenirs in Ho Chi Minh City for you to choose from. They include magnets, statues, chopsticks and many more. Magnet usually has many different shapes. It can be a kind of fruit in Ho Chi Minh City like mangoes, coconuts, jack fruit or the dragon fruit. It can also be a shape of traditional man and woman in Vietnam in ao dai, Vietnamese traditional costumes. So are the statues. The statues usually are Vietnamese man and woman in ao dai. They have many different colors and different sizes. They are usually sold in pair or as a collection of 4 or more statues. Chopsticks are also a popular souvenir. They are special because of the material they are made of - which is usually special wood in Vietnam. 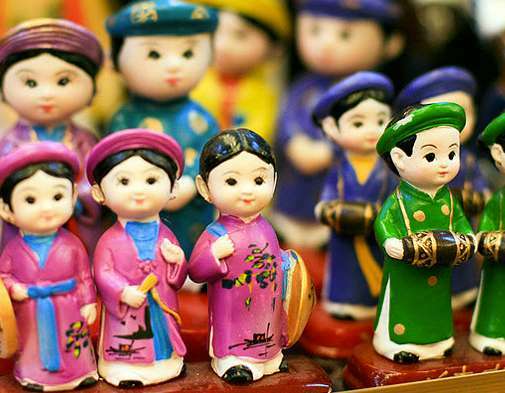 These souvenirs are easily found in Ho Chi Minh City. You can buy one from the street vendors along the boulevards in the city center. The souvenirs sold here are at affordable prices but you can negotiate to get cheaper prices. These souvenirs can also be found in Ben Thanh Market where you need to be more thoughtful about the price so as to avoid being ripped off. Approximate costs: $3 for a set of chopstick; 50 cents for a magnet. If you visit Vietnam, you certainly can’t miss Vietnamese traditional dress called “ao dai". Ao dai is famous for its unique design which is said to make the woman’s body look more beautiful and attractive. You can buy ao dai in many tailor shops in Ho Chi Minh City. Visiting a tailor shop, you can choose the type of material you like with your favorite color and beautiful patterns. Then the tailor will jot down the measurements of your body and make you an “ao dai” as your wish. The waiting time is not very long. In some places, you just need to wait 3 – 4 hours to get a pretty one with high quality. Another place for you to see more diverse patterns and materials is Ben Thanh Market where you have a wide ion for beautiful materials to make your ao dai more special and unique. Sand paintings is one of the most special gifts in Vietnam. The artist use sands to pour in a cup to make beautiful pictures. These stuffs need an extremely focus and skillful hands to paint the picture. You will be very impressed with every work of this art and a huge admire for those artists. So are the receivers of your gifts. The pictures made of sand are usually about Vietnamese lives. It can be a house in a country side with coconut trees, the rivers, the fields with cows and buffaloes. It could be a day of working on a field of the farmers or pictures of beautiful girls dressed in white ao dai which gives you the feeling of peaceful and cute. There are many different pictures on these cups. Other pictures are about flowers, portraits, icons or scenery. You can buy one picture from the shop or you can choose your favorite picture from the catalogue, order it at the store and wait for a few days to receive it. Sand pictures are usually sold in specific shops with its famous brand names such as Y Lan sand pictures or Van Thien Sa sand pictures. The prices are affordable too so you can buy a beautiful, unique souvenir from Ho Chi Minh City. Another thing that can be bought home with you is dried food. There are many different kinds of dried food from the salty, spicy ones to the sweet ones. The most popular ones in Ho Chi Minh City is probably dried squid, dried beef and many different kinds of dried fruit such as jack fruit, coconut or banana. Note, however that, your home country may not allow animal-related products upon your return. There are many different brand names for these foods. You can come across many of them when you are in a supermarket or market. Most of them are good but to pick out the best one, you can get advices from the shop owners. Another place you can get delicious snacks or food to munch is Ben Thanh Market. Different from what is sold in supermarket, dried food is often sold in bulk and not pre-packed. You can buy in grams and the sellers will measure and pack all later. This is a good idea for a unique gift because it brings you the chance to enjoy the taste of Vietnamese food. It is something that is particularly special about Vietnam. Who knows, you might miss it when you’re coming back to your home country. Approximate costs: $3 for a big size dried food packs.